View More In Low Voltage Transformers - Page 5. 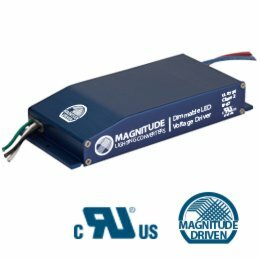 Magnitudes E60R24DC dimmable voltage LED driver is class 2 rated and designed to operate with any standard MLVIncandescent TRIAC Leading edge dimmer switch. The drivers low pro file aluminum case makes it the perfect choice for under cabinet lights tape lights and various LED fixtures installations. Our electrical specification includes Auto Reset over current and short circuit protection. Efficiency of 90 and higher allows the driver to operate at low temperatures.Features. UL 8750. IP67 - Withstands wet and salty conditions.. FCC 15 part 2. 24V DC True RMS.Specifications. Max Load - 60W. Input Voltage - 120V AC. Input Current at Max Load - 0.61 A. Output Voltage - 24V DC. Output Current at Max Load - 2.63 A. Power Factor - 0.95. Efficiency - >90. Operating Temp. -20C - 70C -4F - 158F. Short circuit protection - Yes. Over current - Yes. Over temperature - Yes. Open circuit protection - Yes. Input Wires White Black - 14 AWG. Output Wires Red Black - 18 AWG. Dimensions - 4.92 x 1.97 x 0.77 in.. Item Weight - 9 oz. IP67 - Withstands wet and salty conditions. If you have any questions about this product by Magnitude Lighting Converters, contact us by completing and submitting the form below. If you are looking for a specif part number, please include it with your message.